I've shown you over and over again that art can be made out of truly anything, and here I am to do it again. 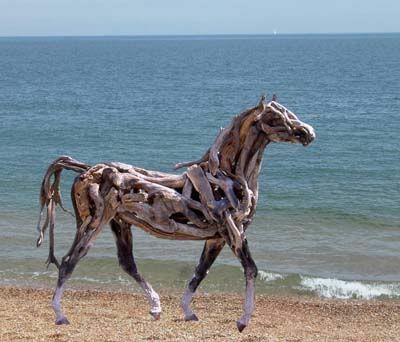 This time, it's pieces of driftwood turned into beautiful horses. Heather Jansch has an entire collection of pictures on her website, and a book for purchase, too. Check out the FAQ to find out how she creates her pieces...and for some loving answers about why she sculpts, where she finds her inspiration, etc. 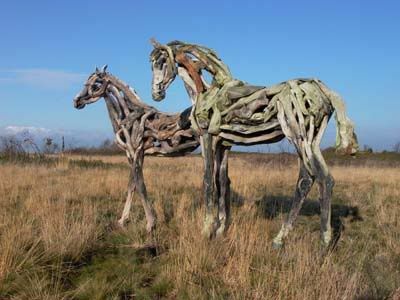 These driftwood horses are amazing! Serendipituous... a lover of art myself. I want this horse!!!! byw... check out www.profileinwood.com for something you might find quirky!